The Mount Vernon Trail runs parallel to the George Washington Memorial Parkway and follows the west bank of the Potomac River from Theodore Roosevelt Island to George Washington's Mount Vernon Estate. The paved multi-use recreation trail is nearly 18 miles long and is a favorite of area cyclists and runners. 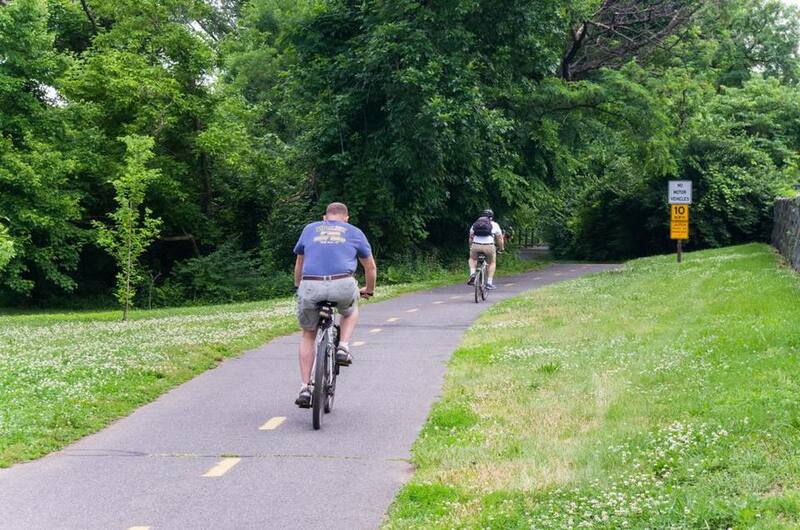 The trail offers wonderful views of the Potomac River and Washington DC’s famous landmarks. The terrain on the Mount Vernon Trail is fairly flat and an easy bike ride. The path passes through Old Town Alexandria where it requires riding on the street with vehicle traffic. At the northern end of Roosevelt Island, you can cross the footbridge and head west on the Custis Trail which connects to the W&OD Trail, a 45-mile rail trail through Northern Virginia. South of the Woodrow Wilson Bridge, the last mile has a pretty good climb heading toward Mount Vernon. Theodore Roosevelt Island - The 91-acre wilderness preserve has 2 1/2 miles of foot trails where you can observe a variety of flora and fauna. A 17-foot bronze statue of Roosevelt in the center of the island serves as a memorial honoring Roosevelt's contributions to the conservation of public lands for forests, national parks, wildlife and bird refuges. Parking: Limited, gets busy on weekends. Bikes are not allowed on the island. Arlington National Cemetery - More than 250,000 American servicemen as well as many famous Americans are buried at the 612-acre national cemetery. Guided tours are available and visitors are free to explore the grounds. Parking: Paid lot available for visitors. Lyndon Baines Johnson Memorial Grove - The memorial is set in a grove of trees and 15 acres of gardens along the George Washington Memorial Parkway. Navy-Marine Memorial - The statue of gulls in flight above a wave honors Americans who have served at sea. At this point along the Mount Vernon Trail, visitors see a great view of the Washington DC skyline. No Parking. Old Town Alexandria - The historic neighborhood dates back to the 18th and 19th centuries. Today, it is a revitalized waterfront with cobblestone streets, colonial houses and churches, museums, shops, and restaurants. Riverside Park - The park, nestled between the GW Parkway and the Potomac River, offers vistas overlooking the river and views of osprey and other waterfowl. Several Metrorail stations are within close proximity to the Mount Vernon Trail: Rossyln, Arlington Cemetery, Reagan National Airport, and Braddock Road. Bicycles are permitted on Metrorail weekdays except for 7-10 a.m. and 4-7 p.m. They are also permitted all day Saturday and Sunday as well as most holidays (limited to four bicycles per car).